I was one of the privileged 320 passengers onboard the first A350 commercial flight, flying on Qatar Airways from Doha to Frankfurt on Thursday, January 15, 2015. The decision to take part in this historic event was made less than a week before the flight and by that time business class had already sold out. So instead of taking advantage of an amazing business class ticket offer out of Cairo (less than $800) I paid $395 to fly economy class from Dubai to Frankfurt via Doha (about $100 cheaper than just Doha – Frankfurt). The chance to be onboard the first ever A350 commercial flight made this an easy decision. I met up with a group of airline aficionados in the impressive Qatar Airways Al Mourjan Business Lounge (review coming) including Ben from One Mile at a Time, Sven from Sven Blogt and the infamous Gino, the first passenger to fly in The Residence on Etihad Airways’ A380. After a tasty breakfast featuring Krug, we headed down to the gate area to check out pre-boarding festivities. The gate area was adorned with balloons and featured a musician playing an oud, a traditional Qatari string instrument as well as roaming Qatar staff offering a sparkling non-alcoholic beverage and light canapés. Upon entering the gate area, Each passenger received a gift bag containing an A350 model and a first flight certificate. CNN’s Richard Quest was on-scene to cover the event. As we all stood by the window snapping picts of the new aircraft, Quest came up to us with his camera crew and began filming us – we’ll see if I make the editing cut on an upcoming edition of CNN Business Traveler. Richard should have been in the picture too – he is certainly an #avgeek himself. The guy to my left on the far right of the picture is Thomas Lee, who also flew on the 747, A480, and 787 inaugural flights. An array of executives were there including Airbus CEO Fabrice Bergier and even His Excellency, Akbar Al-Baker, Chairman of Qatar Airways eventually arrived. Boarding began on time and riding on the coattails of my fellow enthusiasts, I boarded early with the business class passengers. Stepping onboard the aircraft the immaculate lobby bar area greets you, with semi-circular granite countertops and a golden dome above and wooden floors below. After snapping several pictures in business class, I made my way back to economy class where I found my seat in 26A, not that I was ready to sit down. Windows are much larger on this aircraft and a new indicator reminds passengers when seat belts must be on, smoking is prohibited, electronic devices must be switched off, and cell phones can be in transmit mode. A special A350 amenity kit was distributed in business class. Stay tuned for an upcoming giveaway contest! Economy class offers 32” of legroom and an 18″ seat pitch in a 3-3-3 configuration with no “premium” economy product. The seat features a bi-fold tray table, giving more knee room, and has an articulating seat pan, meaning that the cushion you sit on slides forward as you recline the seat. Practically, that means you have the perception of a slightly greater recline but still maintain the vital knee room necessary to keep from becoming claustrophobic. The in-flight entertainment box has been integrated into the seat frame, meaning there is no intrusive foot obstruction. The wide seat, quite cabin and generous legroom truly make the aircraft cutting edge. Prior to takeoff, FAs offered a moist towelette and a piece of hard candy, customary on all Qatar flights. Headphones were also distributed. This is one quiet plane! Amazingly quiet throughout throughout the flight. The movie selection was identical to the 787-8 I had flown in the night before from Dubai to Doha: expansive. With over 100 movies as well as TV shows (limited selection), audio and games, there was more than enough material for a longhaul flight. I had watched the pilot episode to “Gotham” the night before and watched the next four episodes over the course of the flight, though I tried to spend as little time as possible in my seat. The 12” Thales entertainment system is touch-screen but also features a handheld-device that can be used as a remote or a game controller. 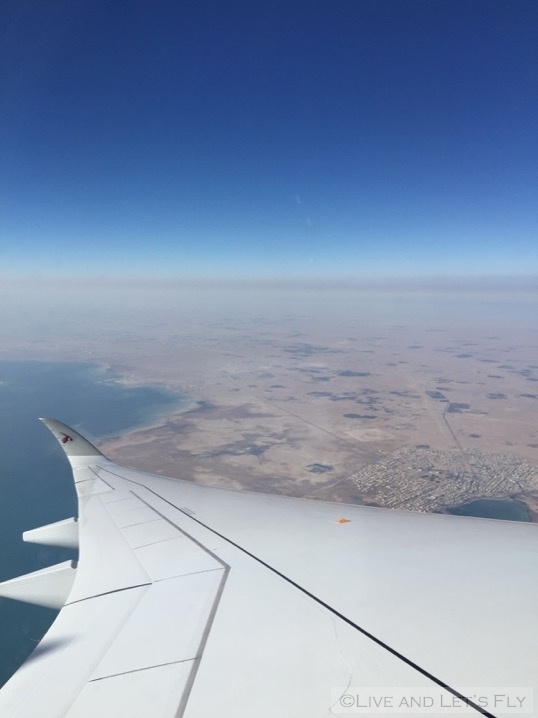 Wi-Fi is available onboard and Qatar offers three data packages—$2USD for 5MB (perfect just for texting and checking e-mail on your mobile phone), $5 for 12MB, or $10 for three-hours unlimited (with no ability to start or pause). Wi-Fi was extremely slow and I was unable to connect through the first two hours of the flight. Meal service was arduously slow. After a beverage service, FAs finally dragged the meal carts down the aisles and distributed breakfast. Three choices today, an omelet with chicken sausage, hash browns and mushroom; pancakes; or an Indian vegetarian breakfast. No Arabic option and meals came with fruit yogurt, fruit, orange juice and a croissant. Real silverware is used in economy class. The food was fair – comparable to a United first class breakfast on a domestic flight (which is a big insult if you ask many UA flyers, but I do not intend it as such) but I was not at all pleased that despite a surplus of FAs onboard, it took two hours to clear away the meal trays. I have never experienced such a delay – it was simply unacceptable, yet I am willing to cut the FAs slack here — they were all courteous and perhaps it just took some time to figure out how where everything goes on the new aircraft. Throughout the first part of the flight Richard Quest and his cameraman wandered back and forth on the airplane, interviewing select passengers, sometimes with the company of CEO Akbar. Now here’s when the fun started. Ben finally rescued me from economy class and I joined the party going on in the lounge near the boarding door. The next two hours was spent chatting, sipping champagne, and it was these two hours that made the flight and the whole trip worthwhile. CEO Akbar was quite chatty: tomorrow I will recount the fascinating, insightful, and at times hilarious conversation we shared. I had the chance to speak to Quest as well on several occasions during the flight – a genuinely nice guy who maintains his on-air personality off the air. He’s an #avgeek himself but hopefully we got him straightened out on what kind of credit card to use – he proudly boasted that he uses the Capital One card [head smack] but now promises to apply for a Chase Sapphire card. He loves his job and it shows. Gino was keen to check it out as well. The flight deck tour never happened during the flight because the flight got bumpy and all were required to return their seat. The six hour flight went by quickly and for whatever reason, I did not have to use the facilities and it never dawned on me to at least go in and snap a few pictures, though an economy class lav is still an economy class lav. I did notice, dutifully following an outdated U.S. FAA guideline in an era in which there are no airlines left which permit onboard smoking, ashtrays are still available on the lavatory doors. No pre-arrival snack in economy and with about 30 minutes of flying time left, FAs collected blankets and ordered everyone to put their window shades up (which still are manual on the A350 in economy class, though business has the Airbus signature blinds). After a long taxi, we pulled up at the gate to see roughly 100 people standing around to snap picture as the aircraft rolled in. While economy class on an A350 is not a revolutionary experience, the next generation economy class seat is comfortable and more spacious than most of its competition, IFE exceptional, and Qatar has invested in the future by ordering 80 of these aircraft that are far more fuel efficient than its A340 fleet. And perhaps more stunning than the fuel efficiency is how quiet this airplane is onboard. More quiet than the nose or upper deck of a 747! The highlight of my flight was naturally the time spent in business class, but Qatar offers a solid and affordable economy class product. It was great to be on the historic first flight of the A350 and I hope to fly on it several more times in the coming years, though hopefully in the forward cabin! Stay tuned tomorrow for the true highlight of the inaugural flight — chatting with Akbar. Next Article Royal Air Maroc to Join Star Alliance? Thanks for the report. Sounds like a great time! Hopefully the mediocre service was just an aberration. On my last QR flight, the Y-class service was exceptional, though the food was similar to your experience, just OK. Awesome experience Matt!! So glad you got to be part of this and thanks for sharing! This looked incredible! Great write-up – thank you! Looking forward to more tomorrow. I believe the ashtray is there in case someone is caught smoking by the crew – so the flight attendants have somewhere to extinguish the cigarette safely. Enjoyed the report greatly. Thanks for sharing! Hmmm that economy class seems a lot nicer than the same cabin with other airliners. Please note that you made a little typo, I believe you meant to say A380 instead of A480.